(Phys.org)—Salmonella typhi is a particularly nasty bacterium that targets only humans and causes typhoid fever, which kills hundreds of thousands of people annually. In a new study appearing in the Nov. 16 issue of the journal Science, Yale scientists explain how evolution shaped the pathogen to be so selective. Jorge E. Galan, the Lucille P. Markey Professor of Microbial Pathogenesis, and colleague Stefania Spano coaxed Salmonella typhi to survive within immune cells of mice—a species that in nature cannot be infected with the pathogen. 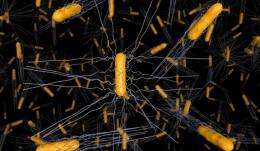 They managed the trick by introducing a single gene from a related strain of Salmonella that can infect multiple species. The gene enable S. typhi to destroy a molecular courier known as Rab32, which under normal conditions helps arm anti-microbial defenses against the invader. "The immune system is still firing the bullets, but this pathogen has learned how to dodge them in humans but apparently not in other animals," Galan said.